It might feel silly to massively worry about your kids’ first teeth, especially as they are only going to be around for the first eight to ten years of your child’s long life, but those tiny teeth are worth an ounce of concern. Once the grizzling and fussing of teething culminates in a mouth full of pearly whites, it’s forgiveable to think that the worst days are behind you – but unless those teeth are taken care of properly, you could end being the parent forcing their child into the dentist’s chair for yet another filling. Without a healthy set of baby teeth, it’s more likely that issues will be had with their adult teeth as the little gnashers act as place holders for the bigger ones. Decay in milk teeth can also cause speech and eating difficulties for your kids, so it’s essential to instil good oral hygiene habits into their routine at an early age. A soft or an electric toothbrush specifically for children is essential for not damaging the enamel on young teeth, and as long as you supervise there’s no harm in letting your kids have a go at brushing themselves – the more fun the activity, the more likely they are to want to do it again and again! Not all kids are keen on brushing their teeth though, so here are some great tips from parents for parents, if you struggle getting your kids to brush their teeth. They’re really helpful! Be sure to use toothpaste with fluoride in, as this will help control tooth decay – but also ask your dentist for advice on products, as some contain more fluoride than others. Guiding your child’s hand so they know where to clean, and doing it in front of a mirror are both great ways of teaching your kids how to clean their teeth, but as with most things in their early years, they will also learn from watching you – so why not clean your teeth together? The NHS recommend that kids clean their teeth before bedtime and at least at one other time during the day. There are also certain foods that can help promote healthy teeth and gums (e.g. cheese, carrots, yoghurt etc), but if you want to give sugary treats, make sure to give them as a pudding after a meal instead of a snack. There is likely to be more saliva in the mouth after a meal, resulting in less sugar remaining in the mouth. Offering your child water instead of fruit juice or fizzy drinks encourages healthy eating as well as good dental care – where possible buy sugar-free squashes as a fun alternative to water. Ensuring your child gets what they need may not always be equal to what they want, but being strict on good dental routines now will only stand them in good stead for adult life – who knows, one day they might even thank you for it! 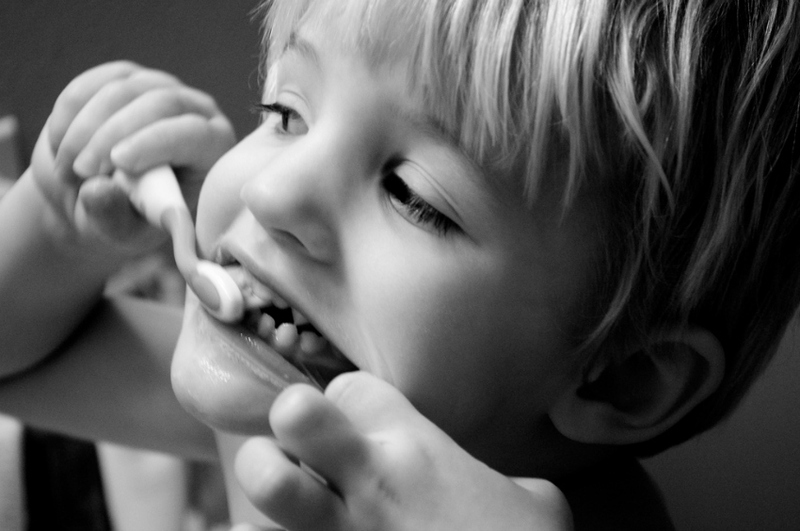 What are your tips for getting kids to learn good dental hygiene? Images by Seth Stoll and makelessnoise via Flickr.